Despite decades of scholarship, many misperceptions persist concerning the Civil War. The war is often viewed, for example, as solely a white man's war; it is also often thought to have taken place solely in the East and South. Modern historians are attempting to dispel these notions, both of which serve to obscure the participation of Native Americans in the Civil War. During the period of 1861 to 1865, Native Americans all over the continent were struggling for autonomy, as peoples with their own organization, culture, and life-style. Some tribes, like the Cherokees, were directly involved in the war. Other Native Americans living in the war-torn areas of the East made individual decisions as to whether they wished to have anything to do with the situation. Still others, living in the mountains, prairies, and deserts of the rest of the country, suddenly realized they had a chance to take back some of their own land, as they saw fewer and fewer U.S. Army soldiers assigned to forts in their tribal areas. Statistics show that just fewer than 3,600 Native Americans served in the Union Army during the war. Perhaps the best known of their number was Colonel Ely Parker, who served as an aide to General U. S. Grant, and was present at General Robert E. Lee's surrender at Appomattox Court House. Statistics for the Confederacy are not reliably available, but most scholars of Native American involvement in the actual fighting of the war are very well acquainted with the major Southern figure among them: Brigadier General Stand Watie, a three-quarter blood Cherokee who was born in December 1806 near what would become Rome, Georgia. Stand Watie was one of the signers of a treaty that agreed to the removal of the Cherokee from their home in Georgia to what was then the Indian Territory (aka Oklahoma Territory); this split the tribes into two factions, and Stand Watie became the leader of the minority party. At the outbreak of the Civil War, the minority party gave its allegiance to the Confederacy, while the majority party went for the North. 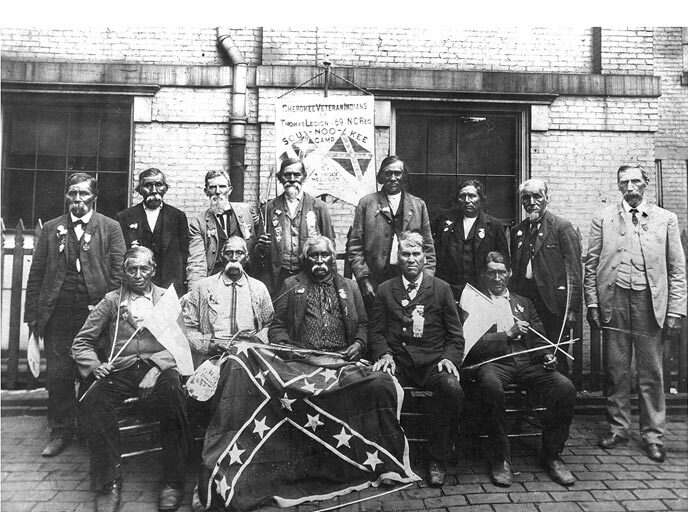 Watie organized a company, a regiment known as the First Regiment of Cherokee Mounted Volunteers; the regiment fought at Wilson's Creek, Elkhorn, and in numerous smaller fights and skirmishes along the border with what was known as Indian Territory. The warriors found curious the white man's strategy of standing still and allowing people to shoot at them, or lob artillery shells at them; the Cherokee tended to be spectacular at wildly brave mounted charges, but once the artillery began to fire, the warriors wanted nothing to do with it. Stand Watie surrendered the final Confederate forces on June 23, 1865. And this was over two months after General Robert E. Lee had surrendered to General Grant at Appomattox. Watie died in 1871 and is buried in the Old Ridge Cemetery in Delaware County, Oklahoma. While the war was raging in the East, in the West things were seldom quiet or peaceful. Statistics show that nearly 90 engagements were fought by U.S. troops in the West during the war, most of them involving Native Americans. From January to May 1863, there were almost continuous fights in the New Mexico territory, as part of a concerted effort by the Federal government to contain and control the Apache. In the midst of all this, Abraham Lincoln met with representatives from several major tribes and informed them that he believed they would never attain the prosperity of the white race unless they turned to "farming as a way of life." In July 1864, there was fighting against Native Americans in Minnesota and fighting continued throughout the year in New Mexico, as well. Then in November, on the twenty-ninth, there occurred what some historians have called the first major blot of the so-called Indian Wars: the Sand Creek Massacre. Frightened by raids made by warriors in the area around Denver as a result of a reduced military presence in the West, Colorado settlers asked Colonel J. M. Chivington to punish the raiders. Chivington, with 900 volunteer militiamen, attacked a peaceful village of some five hundred or more Arapaho and Cheyenne natives, killing women and children as well as warriors. In his report, Chivington chillingly stated: "It may perhaps be unnecessary for me to state that I captured no prisoners." Some of the people escaped, however, and at least one of them was pursued by irony in the years to come: Chief Black Kettle of the Cheyenne survived the massacre at Sand Creek, only to die at the hands of George Armstrong Custer's 7th Cavalry in a second attack on a peaceful village some three years later, at a place called the Washita River. After the Civil War, the white presence in the West rose to new levels. Numerous financial crises and depressions hit the East during the Civil War aftermath and Reconstruction, and many families chose to move onward in hopes of finding gold or purchasing cheap land to start a farm. Men unable to find work in the cities joined the army. As the tribal peoples fought to defend their sacred places, hunting grounds, and even their very way of life, they attacked crews building railroads and sought to drive off hunters and gold prospectors. Conflicting views of what ownership of the land meant, as well as numerous other cultural misunderstandings, led to bloodbath after bloodbath. At Little Big Horn and Beecher's Island, the tribes defeated the white man, only to be battered into defeat themselves at places like Wounded Knee. The official army policy was to provide necessities for the tribes during the winter, then to face the reality of fighting the same people when the weather cleared. When American Indians desired to relocate to necessary hunting grounds they were attacked by the United States Army. This policy was known ironically to the common soldier as "feed 'em in winter, fight 'em in summer." The unofficial government policy, however, was summed up curtly by General Philip Sheridan, the man who in 1864 stated he would so devastate the Shenandoah Valley, breadbasket of the Confederacy that a crow flying through it would have to "carry his own rations." Sheridan, appointed to command of one of the major administrative departments of the territories in the years after the war, made the now-infamous statement: "The only good Indian I ever saw was dead." With this attitude, it was only a matter of time and attrition before the Native Americans saw their way of life taken from them-not forever, though, as the descendants of those who fought to save "The Way" are even today striving to bring back the old knowledge and customs. Recommended Reading: The American Indian in the Civil War, 1862-1865 (Bison Book) (403 pages) (University of Nebraska Press). Description: Annie Heloise Abel describes the divided loyalties of Native Americans and the American Civil War and makes it vividly clear that it brought only chaos and devastation to the Indian Territory. For example, she describes in detail the 1862 Battle of Pea Ridge, a bloody disaster for the Confederates but a glorious moment for Colonel (later promoted to "General") Stand Watie and his Cherokee Mounted Rifles. The Indians were soon swept by the war into a vortex of confusion and horror. Also consider: Civil War Terror (History Channel) Description: This is the largely untold story of a war waged by secret agents and spies on both sides of the Mason Dixon Line. These are tales of hidden conspiracies of terror that specifically targeted the civilian populations. Engineers of chemical weapons, new-fangled explosives and biological warfare competed to topple their enemy. With insight from Civil War authorities, we debunk the long-held image of a romantic and gentlemanly war. To revisit the past, we incorporate written sources, archival photographs and newspaper headlines. Our reenactments bring to life key moments in our historical characters' lives and in each of the horrific terrorist plots.